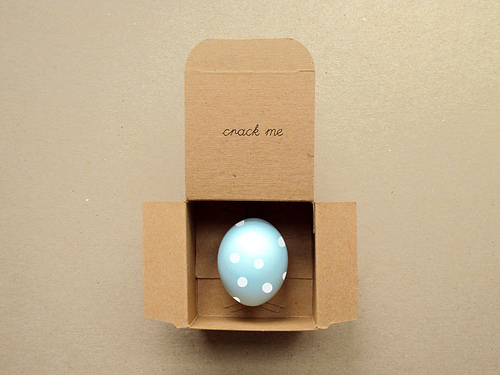 Last year we tried our hands at hiding messages in Easter eggs. I had almost forgotten about it until I started thinking about making cascarones this year. And I remembered that trying to dye empty Easter eggs is a very messy venture. But I am going to make them again this year, but I am going to be older and wiser! So if you want to create these very cute easter egg love notes, you can check out the tutorial over at Poppytalk. And two tips that will come in handy. 1 - Either dye the eggs before emptying them or wear gloves! Unless you want to have dark purple hands for a week. Or skip the dyeing all together and just paint them! 2 - After you poke the two pin holes in the eggs, use a skewer to break the yolk before trying to blow the egg out of the shell. You will thank me for this one. I think I still have time for this one. Cute. I think this one is too late.